Perfectly contoured bushy eyebrows can totally change the expression of your face, making you look more dramatic, sensual and memorable. The new beauty trends encourage having bold, well-defined brows, therefore everyone is trying to learn how to fill in eyebrows correctly and how to make brow hair grow back quickly for naturally chic looks. Not everyone is granted with bushy brows, and it’s here that our makeup products, tools and makeup application skills come to rescue. In case you still don’t know how to contour eyebrows right, check out our step-by-step tutorial on how to fill in eyebrows and adopt a celeb-worthy look! And the steps are as follows! Step 1: Brush your eyebrows using a spooley brush. 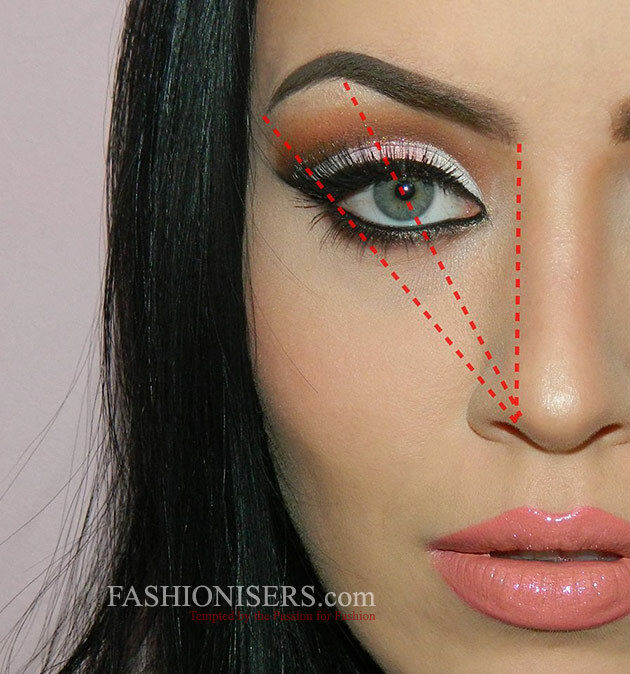 Starting from the middle of your brows start contouring the lower part. For this it’s advised to use a synthetic angled brush and a tinted brow gel (Anastasia Beverly Hills Dipbrow Pomade in Chocolate). It’s vital to choose the correct color of the eyebrow fillers you are going to use, one that will look close to your natural brow shade. Otherwise the brows would look unnatural and unflattering. Keep in mind to never use black gels and black eye pencils for contouring the brows! Step 2: Repeat the same steps on the upper part of your brows. If you don’t have naturally strong brows, draw the brow shape you like most and that flatters your face shape best of all. Now, fill in the contour you have drawn. Step 3: With the product left on the brush start contouring and filling in the first part of your brows. In this way, you’ll create a nice ombre effect that looks much more natural. Step 4: If you are pleased with the shape of your brows, use the tinted gel to fix the hair of the brows. Always remember that the beginning part of your brow must be thicker than the tail. Besides, this part should slightly differ in color, being lighter than the tail. You can fill in your brows using brow gel, wax, eye shadow or eye pencil. As you see, it’s quite easy to fill in eyebrows and get the perfect brow shape you have always dreamt of! Follow the steps and practice at home for a flawless result! In case you want to do this beautiful eye makeup, check out our pinky watercolor makeup tutorial!